The summer months in Texas represent the peak harvest time for many fruits and vegetables and the timing is ideal for garden-based learning. Fresh harvests offer children the opportunity to taste just-picked picked items while learning what a fruit or vegetable looks like in a natural, unprocessed state. School sponsors and sites can plan to use current campus gardens throughout the summer months, offering summer meal program participants the opportunity to plan, tend and harvest fruits and vegetables. Non-school sponsors and sites can partner with local school or community gardens to offer enrichment activities. 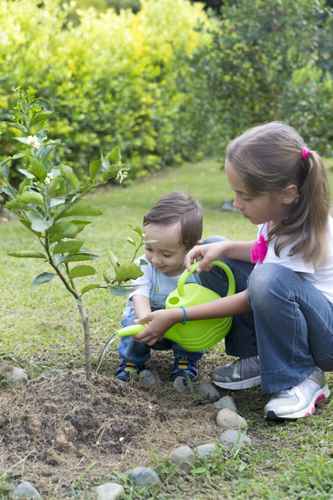 Tending school gardens during the summer vacation offers a great learning opportunity. Through a partnership with the City of Plano City Garden, Plano ISD connected community members to the summer meals program through garden-based learning opportunities. Summer meal program participants were invited to educational sessions at the city garden to connect with fresh fruits, vegetables and herbs. Educational topics included how and where food is grown, the importance of fresh fruits and vegetables and sustainability.